Sailors daydream about cruising the oceans under canvas, but the truth is that yachts are terrible boats for living in. The cabins are cramped and incredibly awkwardly shaped, and everything is at an angle if you are under way which makes cooking and even sleeping virtually impossible. I've always hankered after a nice Dutch barge with lots of room on the deck for rowing boats. Bags of headroom, you can boil a kettle when moving and you can get to your destination on schedule without feeling guilty about switching the engine on. If you power the boat with chip fat, you can even save the planet a bit. 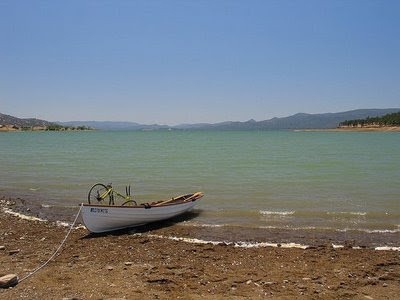 And when you arrive, you can launch the boats and have a nice row, paddle or even a sail. Bliss. Rick Thompson has actually done it. 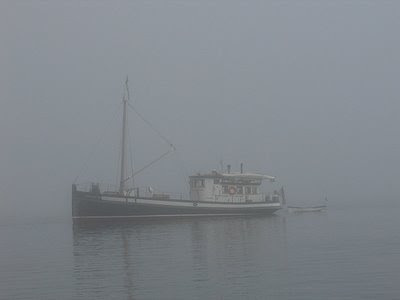 This is the 'mother ship' David B in the fog of San Francisco Bay, with his Gig Harbor 14ft Whitehall behind. I have seen your blog. I seem to run into it when searching for a rowing or traditional boat topic. It's great, lots of unusual stuff. The boat is named The Rat, which might be from Wind in the Willows, but more likely from my wife's opinion of me for spending too much time out rowing. 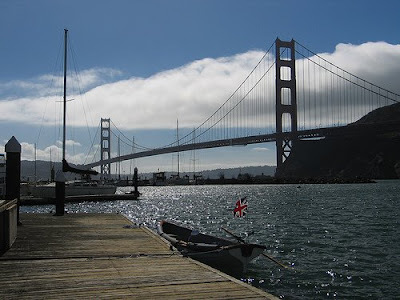 The pictures are from trips in the San Francisco Bay area and US West Coast. I do row a lot, but have not had any major disasters to produce a good trip story - rowing is mostly a contemplative activity. On the pennant, I have lived in the States most of my life, but am still a Brummie. I love that comment about rowing being a contemplative activity. So right. Oh, I forgot: the pennant. This photo explains: Once a Brummie, always a Brummie and quite right too. Another item I would pack on my Dutch barge is a bike, for trips inland, and Rick has thought of that too: There are more pics at Rick's Flickr site.